This is an easy summer recipe when you want to eat well but still want to spend more time outside than in the kitchen. 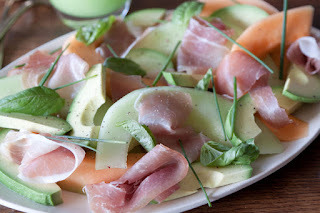 The fresh melon salad with chive and tossed new potatoes is perfect to serve with cold cuts like ham or turkey. The mint can also be substituted with fresh basil. 1. The salad: Slice the melon into smaller pieces and combine with lemon juice, oil, and mint. 2. The potatoes: Brush the potatoes clean and boil in lightly salted water until tender. Let the steam release. 3. Melt the butter and add the chives. Pour the herbed butter over the potatoes and toss. Serve immediately with the melon salad and ham. Barley is a terrific grain to use in salads. Plan to buy whole barleycorn as crushed barley has a tendency to become like gruel. I prefer to use pearl barley, which is grain cut up into smaller pieces. The salad is also excellent when topped with warm smoked salmon. 1. Boil the barley, covered, according to the instructions on the packaging. Add bouillon or salt toward the end of the cooking time. Pour out the excess water and let the steam release. 2. Thinly slice the fennel, sugar snap peas, and onions. Rinse the spinach and dry the leaves carefully. In the summer, I can’t get enough of these wonderful salads that feature new potatoes. For me, smoked fish is also standard summer fare, so what could be more summery than a potato salad with smoked salmon and shrimp? Considering smoked fish has a fairly strong flavor, fruit makes a fresh and welcome addition to the salad. Here I’ve used melon, but nectarines or pears are also excellent. 1. Boil the potatoes in lightly salted water. Let the steam release and cut the potatoes in half. 2. Combine the lemon, olive oil, dill, salt, and pepper. Toss the potatoes with the dressing from step six and let chill. 3. Peel and cook shrimp. Cut the salmon into smaller pieces. 4. Cut the pulp of the melon into smaller pieces. Thinly slice the pea pods and onions. 5. Lay the lettuce on a serving dish. Top with the potato salad, salmon, and shrimp. Serve with lemon wedges and dressing. 6. The dressing: Thaw the spinach. Drain through a sieve and press out all the liquid. Mix together all ingredients. Add salt and pepper to taste.